"The excitement and anticipation that comes with planning a holiday is electric. From the moment we set our hearts on visiting Alaska and Canada, all waking thoughts are flooded with striking images of beauty. Snow capped mountains standing guard over pristine lakes below; trains sailing at lightning speed through thick, dense forests; brown and black bears fishing for salmon knee deep in icy cold rivers; quaint fishing villages beckoning visitors to come and explore, and of course the stunning 300ft, 200 hundred year old glaciers standing majestically, reminding it’s human visitors just how petite we really are. Of course with so many wonderful options available, there is a temptation to keep adding towns, tours and activities to an itinerary. If you have the time and budget, then this is not a problem. However, often this isn’t the case and people try to squeeze too much into their tour. As with most things in life, quality is better than quantity. Here are some ways you can make the most of your adventure"
Send us a very quick EMAIL and we'll send you a FREE TRAVEL GUIDE on how to make a memorable trip to Alaska and Canada. 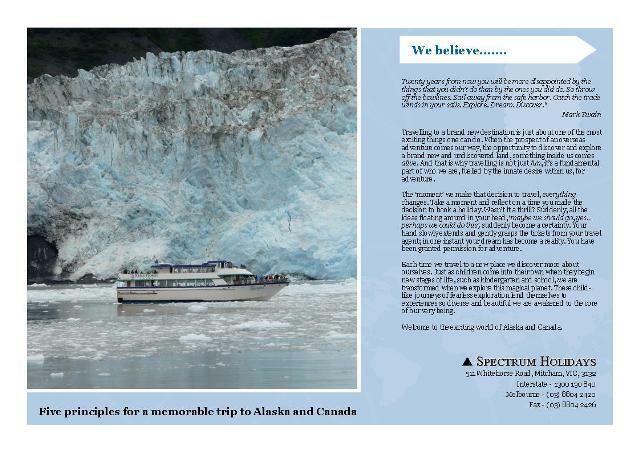 We are officially recognised as Alaska Certified Experts and Canada Specialists, and have been operating in the travel industry since 1984. We are passionate about helping you with that old fashioned style called customer service.